At [Mosaic Edition] (hereafter Mosaic Edition), we understand your concerns about the privacy of your personal information. We are committed to protecting your privacy. Because of this, we have established the following guidelines concerning the collection, use and security of information we collect from you. 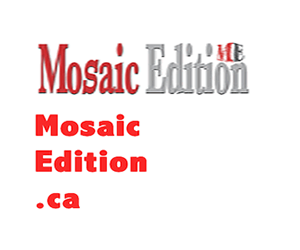 This Privacy Statement applies to [mosaicedition.ca] as well as the external client registration linked sites. This Privacy Statement discloses our information practices, pertaining to how we collect, use and store your personal information on our Site. “Personal Information”, refers to information which, can be used to identify an individual such as a name, or email. Since January 1, 2004, all Canadian organizations engaged in commercial activities are required to comply with the Personal Information Protection and Electronic Documents Act (“PIPEDA”) and the Canadian Standards Association Model Code for the Protection of Personal Information incorporated by reference into PIPEDA. We shall not sell, share, or rent this information to third parties for their promotional purpose, nor will we use your information in ways different from what is disclosed in this Statement. We collect information from our users at several different points as described below. We collect your name and email addresses for the purpose of sending you our EMAIL Newsletter. We use a third party agent to process the delivery of our newsletter. This third party agent is not authorized to use your information for any other purposes; promotional or otherwise. Unfortunately, no data transmitted over the Internet can be guaranteed to be 100 per cent secure. As a result, we cannot assure the security of any information transmitted to us and you do so at your own risk. We will not disclose any of your personal information, except when we believe in good faith that the law requires it, or to protect the rights, or property of [MOSAIC EDITION] and staff. However, we reserve the right to release personal information to our service providers, law enforcement, or other government officials, or in response to a formal request in a civil action, court order or judicial proceeding, as we in our sole and absolute discretion, deems necessary or appropriate. Moreover, in the event of a sale, merger, or acquisition of some, or all of [MOSAIC EDITION] or assets, your personal information would likely be a part of the transferred assets. In such an event, we shall notify you via email of your choices as a user, on how your information is to be used henceforth. If you click on third party website links that are hosted in the U.S.A., your personal information will be transferred outside of Canada; and your personal information will be subject to the laws of the U.S.A. jurisdiction; and the laws of the foreign jurisdiction may be different (and less protective) than those of Canada. Information stored in or transmitted to the U.S.A. may be available to the U.S. government or its agencies under a lawful order made in that country, including under the “PATRIOT ACT”. You have a right to challenge the accuracy and completeness of your personal information and to have it amended, as appropriate. You also have a right to request access to your personal information and receive an accounting of how that information has been used and disclosed, subject to certain exceptions prescribed by law. For example, if the requested information would reveal personal information about another individual, your request for access may be limited or denied. If your request for access is denied, [ MOSAIC EDITION] will notify you in writing of the reason for the denial.